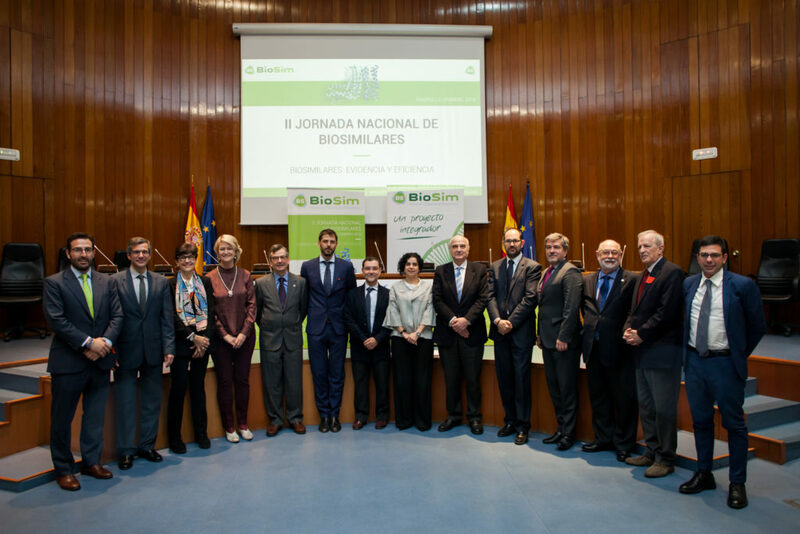 The 2nd Spanish Biosimilars Conference organised by BioSim, the Spanish Association of Biosimilars, took place in Madrid on 21st February at the headquarters of the Ministry of Health, Social Services and Equality. This second conference of its kind brought together several important ministry subdivisions, medical and patient associations, healthcare professionals, specialised communication media and representatives from the pharmaceutical industry. The conference’s opening remarks and welcome address were delivered by the President and the Managing Director of BioSim, Joaquín Rodrigo and Regina Múzquiz, and the General Secretary of Health and Consumer Affairs, José Javier Castrodeza. The meeting kicked off with the presentation “An overview of biosimilars” by BioSim’s President, before continuing with Roundtable 1 on “Evidence: from R&D to authorisation”, where Francisco Olivera, Operations Manager at mAbxience, talked about the R&D process and the production of biosimilars. Regarding the company’s working practices, Olivera spoke about “Safety and efficacy: two fundamental aspects that govern our working processes from the moment we decide which molecule we are going to develop and manufacture through to the end of the project life cycle”. He also mentioned that specialisation is a determining factor when it comes to developing and marketing biosimilars. Significant resources and effort go into the process, but a wealth of knowledge and innovation are also generated. In conclusion, Francisco pointed out that the characterisation of biosimilars is the cornerstone of the biosimilar development process, which requires in-depth knowledge of the physicochemical, biological and functional characteristics of the drug. Afterwards, Roundtable 2 dealt with “Efficiency: managing biosimilars in a hospital setting”. Several executive speakers took part and it was commented that, in addition to offering sustainability for the Health System, biosimilars provide great innovation in terms of safety and accessibility to new treatments. Aspects of health economics were also discussed, concluding that biosimilars have a positive effect, since competition stimulates innovation. International experiences were also highlighted, for example with the participation of the Head of Medicinal Products Policy for Italy’s Campania region, Ugo Trama, who explained how the relationship between the clinician and the hospital pharmacy is key to prescribing the most appropriate therapy and limiting expenditure. Roundtable 3, “From prescription to patient”, involved the participation of Dr Balsa, a rheumatologist and member of the Spanish Society of Rheumatology (SER), who mentioned that the SER is in favour of biosimilars and has recently updated its position statement on these drugs. The Patient Organisation Platform (POP) took part in this Roundtable, with a talk entitled “The patient’s perspective as end users of biosimilars”, where it was highlighted that a lack of information has led to distrust and fear among patients but also that biosimilars are here to stay, and it is necessary to guarantee safety with optimal pharmacovigilance. Ms Encarnación Cruz, General Director of the Basic Portfolio of Services of the National Health System and Pharmacy of the Ministry of Health, Social Services and Equality, delivered the conference’s closing remarks. Biosimilars are giving patients improved access to medication and revolutionising the treatment of the diseases for which they are indicated. The conference benefited from high-level speakers and content and was well-attended. II Jornada de Biosimilares. 21st February 2018. Madrid.